The highlight of Franklin’s fall season is just around the corner and it’s time for both people and pets to dust off their Halloween best. 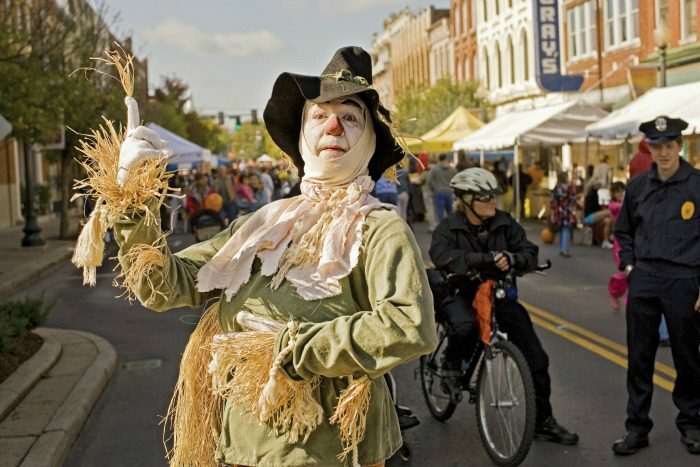 One of Pumpkinfest’s favorite traditions, the costume contests for both humans and pets, will be held on the Heritage Stage on the Public Square beginning at 1:45 p.m. on Saturday, October 24. Contests will be held in the following categories: Ages 0-2, 3-5, 6-11, and 12+. There is also a category for groups. Pumpkinfest sponsor HomeTown Pet will be sponsoring the pet costume contest. Signups for humans will be next to the Heritage Stage on the Public Square from 10 a.m. – 1:30 p.m., with a $2 entry fee. Signups for the HomeTown Pet Costume Contest will be at the HomeTown Pet booth, #26, on the Public Square, with no entry fee. All entrants must be signed up by 1:30 p.m.
Prizes for people will be provided by Vintage Baby, For Every Child, and Sweet CeCe’s. HomeTown Pet will be providing prizes for the pet costume contest. For more information on the costume contests and Pumpkinfest, go here.